The pilot is ensconced in a harness suspended from the airframe, and exercises control by shifting body weight in opposition to a control frame. Now this truly takes us into the eye of the storm as it relates to what it takes to go to that next level of the unknown or to a place that somehow stunts you or shuts you out. Today is a special day for me because I am stepping into a new frame as a singer. I was not forced to this place, nor do I have anything to prove to anyone outside of myself. It is such a gift that today I woke up feeling as though I was about to go hang gliding. The interesting thing is, I have never been hang gliding in my entire life. I just mentally feel that the emotions I am experiencing right now would be similar this. 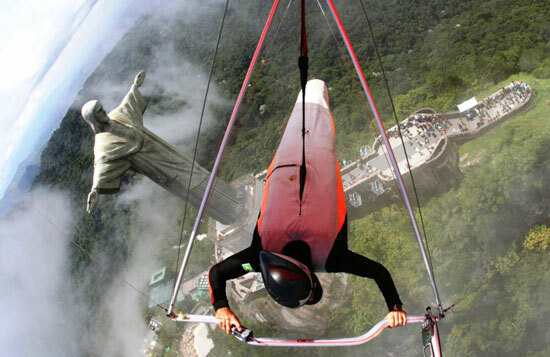 One would think that when you are hang gliding, all things would be below you and you would view them from a completely different perspective. Well of course the perspective is different, the thing that drives me though is that we would have to put ourselves in that apparatus to gain that viewpoint. On the other hand, you might see yourself in that position without even being up there and that is where the magic begins. It has often been said that the mind will go wherever you allow it to and it will not second guess if it is real or not. Now that is something to ponder for sure. Have you ever imagined the feeling of sitting in the drivers seat of a brand new luxury car with fully leather interiors? Maybe you have dreamed about laying on the beach in some far away destination? Maybe you have even pictured yourself locking lips with the man or woman of your dreams? Well these things all stem from a form of mental hang gliding in one way or another. It's when you allow your mind to take you on the journey of your choice and you let the rules fall by the waist side. So today, take an experience that you would like to have and sculpt it from beginning to end in your mind and then take it out as far as you can. You can do this in your mind, on paper, or even with a friend or loved one. By the way, if your experience involves a material thing, go and get close to it today!! For example, if its a car, go and test drive it. If it's a person, ask them to go out with you for a lunch or dinner. This is a great day for hang gliding. Get prepared to feel the breeze in a completely different way.